Without warning, the career of Miami Marlins veteran starter Edinson Volquez is at a crossroads. The Marlins announced Tuesday night that Volquez has a torn ulnar collateral ligament. Volquez will undergo Tommy John surgery on Friday, ending his 2017 season and likely keeping him sidelined deep into the 2018 season. The surgery casts great uncertainty over the 34-year old Volquez, the only major leaguer to throw a no-hitter this season. Volquez originally went to the DL on July 7 with tendinitis in his knee. The Marlins believed he would require a week or two of rest before returning. However, during his knee rehab, Volquez began to complain of elbow pain. Further examination showed the tear in his UCL and the need for Tommy John. In addition to ending his season, the loss of Volquez also deprives the Marlins of their opening day starter. The Marlins signed Volquez to a two-year, $22 million contract during the offseason. They believed he would a steady and reliable veteran presence in a rotation short on both depth and proven commodities. Volquez has made over 30 starts in each of the past five seasons, and so the Marlins believed he was a low injury risk, making his need for Tommy John surgery all the more surprising. This will be the second time Volquez undergoes Tommy John. He had the surgery for the first time in 2009 while he was with the Cincinnati Reds. He had the surgery in August but was able to return to the Reds by the middle of July the following year, making 12 starts to close out the 2010 season. That gives the Marlins some hope that Volquez will heal quickly following the surgery. However, at age 34, Volquez may be slower to return than he was the first time around. With the typical Tommy John return around 12 to 15 months, there’s a distinct possibility that Volquez misses all of the 2018 season. Miami will pay Volquez $13 million next season, money that could be a complete waste if he’s not able to return. The loss of Volquez will also force the Marlins to dip into their minor league pitching depth to finsih out the season. It may also impact the team’s offseason plans with regard to acquiring another starter. On a personal level, Volquez is set to hit free agency following the 2018 season. If he doesn’t return by the end of next season, he risks hitting the open market after a year and a half without pitching. Such a scenario could be problematic for the rest of his big league career. 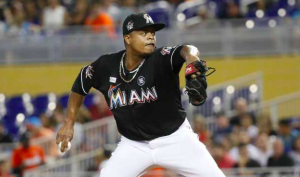 It’s quite possible that Volquez has already thrown his last pitch as a member of the Marlins. Sadly, when the 13-year veteran pitches in the big leagues again is now completely up in the air.